Amber came together as a film & photography collective in 1968. The work has focused on documenting working class and marginalised lives and landscapes in North East England, but in 1977 we opened Side Gallery, which is committed to celebrating the best in the wider tradition of humanist documentary photography. 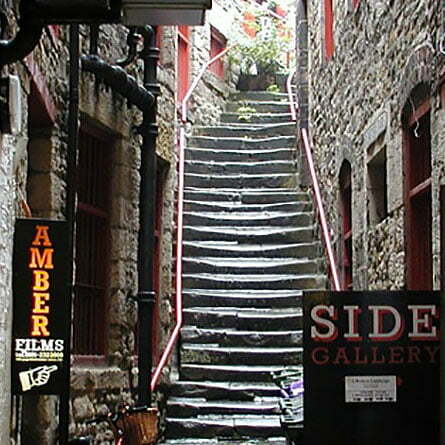 The AmberSide Collection grows out of the work we produce, support and collect: Over 20,000 photographs, 100 films, 10,000 slides; a unique network of 400 stories. In 2011 Amber’s films and collective member Sirkka-Liisa Konttinen’s photographs were inscribed in the UNESCO Memory of the World register as ‘of outstanding national value and importance to the United Kingdom‘. AmberSide Trust was set up in 2015 to secure the collection and support the work. Read the full AmberSide History.